I have figured out salads! It's not a little bit of avocado on a bed of lettuce, it's a little bit of lettuce on a bed of avocado. No, seriously. A giant bed of lettuce is like mowing the lawn, a little bit of lettuce is a delicious accent. So the avocado and the lettuce are the green, then you top the green with good protein, good starch, and another good vegetable. Really this is just last year's chopped salad with more egg and more avocado. Still. I have a cutting board and a knife stashed at work so I can make myself fresh salads for work lunches. I bring the marinated beans in a takealong container. Rinse and drain the beans. Whisk the cider vinegar with the olive oil, and marinate the beans in the vinaigrette. If you made extra marinated beans when you made quinoa salad, you can use whatever you have and just take them out of the fridge. Put as many eggs as you want in a saucepan, cover them with water and bring to a boil. Turn off the heat and let stand for ten minutes, then run under cold water. Peel and slice two eggs. Slice the tomatoes if you don't like cherry tomatoes bursting in your mouth. Halve, pit, peel, and dice the avocado, and chop the romaine. 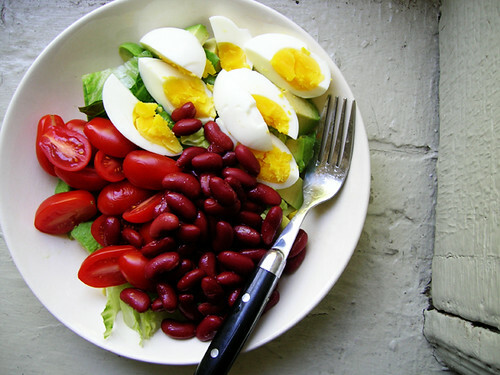 Make a bed of green, then top with sliced eggs, marinated beans, and sliced tomatoes.